Twerkini – to counter the effects of the rhythmic gyrations of one’s Badunkadonk barely hidden by those sheer, skimpy booty shorts so popular today, the comfortably structured contour-caressing nap of this cover-up transforms motion into electrical energy, allowing the wearer to convert the backing-up jiggle of those Glutei Maximi into power to charge cellphones and laptops. Jerkini – for those who suffer from those sudden, involuntary twitches or quivering just when falling asleep, known as a ‘hypnic jerk’, this bio-engineered garment contains one’s arms and legs comfortably, during that interval between wakefulness and dreaming, allowing sleep paralysis to progress. Nitey, nite. 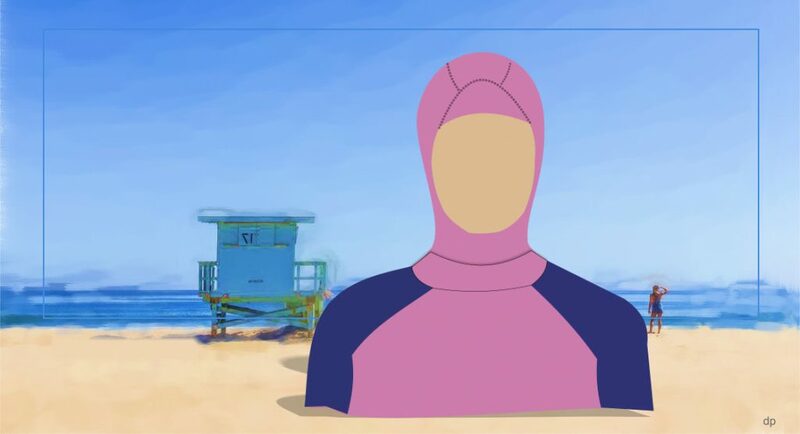 Clerkini – If you’re a County Clerk itching to defy a US federal court order while discharging the duties of the office, albeit while under what one is sure is a higher authority, you’d do well to wear this generically-clerical cover-up, which will make you acceptable to an employer in another line of work. Björkini – An oversized wild silk-and-Tyvek® paper blouse, multicolored pom-pom headdress wig, pants coated with thousands of tiny, functioning bells and LED-backlit Swarovski glass beads. This activewear will proclaim your solidarity with any ‘fountain of blood, in the shape of a girl’, and get the wearer into any Björk concert for free. Kirkini – From the bridge of the Starship Enterprise, and made a fashion staple by Captain Kirk and his crew, the Mid Rise Cropped Kick Flare Starfleet Duty Uniform Pant is sure to Awaken the Force at StarTrek conventions and clam-digging outings. Cirqueini – to help acclimate small children to the visual shock of the acrobats and contortionists in Cirque du Soleil events, at which even the kids’ shows feature acts such as ‘Skeleton Dance’ and ‘Wheel of Death’. This Cirque-themed loungewear is suitable for home use by the adults of the household. No help in treating parents’ ticket price sticker-shock. Stirkini – A biomechanical upper-body suit the arms of which grasp and properly agitate mixed drinks, automatically shaking juice, dairy or egg-based cocktails, vs. stirring those which are only spirits-based, countering James Bond’s fatuous directive, which has led to more than a half-century’s destruction of Martinis worldwide. Hercini – This lululemon®-channels-Simba interpretation of the lion-suit worn by the Roman god Hercules, allows present-day heroes to apply for roles in summer stock adaptations of The Lion King or sideline jobs as mascots in college sports programs all while ‘looking good to the gym and back’. The Lookbook page for the outfit heralds a thigh-flattering technical pant and UV-protectant ‘barely there’ Nulu® fabric for distraction-free pursuit of one’s ancient duty to complete the Twelve Labors serene in the comfort of sweat-wicking four-way stretch.